I’ve always thought of beets as a much maligned foodstuff. I mean, they just don’t have the glamor or charm of more popular roots like carrots or parsnips, or even the whimsical appeal of tubers, like yams or potatoes. It’s like beets are the scrawny kid on the beach who gets sand thrown in his face by the jock, or maybe the chubby kid on the baseball field who’s last to be picked for the team. Poor, plump, unathletic beets! It’s not just beets that evoke this reaction in me, of course. I for one have always been a sucker for the underdog. Is it because I myself have felt like an underdog much of the time? Is it because the underdog generally tends to be the more quirky, the more multi-faceted, the more interesting and more sensitive individual in any competition? Is it because I’ve seen Rocky too many times? Or is it just because the last syllable in the word “underdog” is “dog”? With school just around the corner again (really, where HAS the time gone?? ), all this thought of underdogs reminded me of my own first week as an undergraduate at university. Knowing absolutely nothing about football but eager to take part in orientation activities, I attended the first intercollegiate football game on campus. Okay, actually, I had no interest whatsoever in being part of orientation, but I was pretty sure there might be some guys at the game. And I did want to meet guys. Anyway, our team (“The Lancers”) were suffering a royal pummeling from the opposition (the celebrated Toronto team, if I remember correctly). Every time our guys messed up and fumbled the ball or narrowly missed a touchdown, they’d be greeted with fervent, ear-shattering boos and a chorus of hisses. Except for one guy, that is. This one guy, a lone figure in the crowd, kept leaping to his feet after each mistake, punching his fists into the air above his head and bellowing, “Great effort, guys! Good for you! Way to go–great try! !” Talk about supporting the underdog! In fact, I was transfixed by this bizarre fellow. I mean, rooting for the losing team? I couldn’t help but think, “Wow. That is really admirable. I’d love to meet that guy some time. Actually, I’d like to date that guy*.” In the end, our team still lost, but at least they felt appreciated. These days, I’m a lot more willing to stand apart from the crowd and actively support a less popular concept or foodstuff (it’s pretty much the status quo whenever I eat with my family, anyway, given my oddball dietary restrictions). I tend to harbor the same overprotective feelings for foods I believe are unappreciated. Like beets. Even though the HH thinks they taste like dirt most of the time (never did ask how he’d know that fact), these earthy roots are one of my favorite foods. They’re loaded with folate and potassium; they have some powerful antioxidant properties and are known to help tone and cleanse the liver; they can reduce inflammation in some chronic conditions; and they double as a nifty lipstick in a pinch (thanks for the tip, Cleopatra!). And ever since I learned to roast instead of boil them, I’ve been entirely enamored of these beautiful burgundy bulbs. If you’ve never been a fan, I’d highly recommend trying this recipe. After being roasted to bring out their natural sugars, the beets are cubed and tossed with quinoa, toasted walnuts, and a lemony, garlicky, tangy dressing. The recipe is a favorite of mine, and one I’ve been preparing regularly since the very first cooking class I taught back in 2003. If you’re avoiding fermented foods (as I am supposed to be doing now), simply omit the balsamic and use a bit more lemon juice instead; use dried mustard instead of dijon; and sweeten slightly with a few more drops of stevia. Since we received both golden and red beets in our organic produce box last week, I made the salad with both types this time, but the results really are much more visually impressive made entirely with red beets, as they infuse the quinoa with a brilliant crimson hue that’s quite arresting. (I’ll include an updated photo next time I make it the usual way). Since it stars quinoa, I’m submitting this recipe to Melissa of Baking a Sweet Life for her Let it Grain Blog Event (this month’s edition is Quinoa) and Alyssa’s Thank Goodness it’s Quinoa. Equally delicious cold in summer or warm in winter, this salad is full of cleansing and detoxifying ingredients: beets tone the liver, while cilantro helps to remove toxins from the system. Preheat oven to 425 F/ C. Wrap beets in foil and bake until extremely tender, about 45 minutes-1 hour. Let cool, then peel off the skins and dice into 3/4 inch (2-cm.) cubes. Set aside. Bring water to boil in a small heavy saucepan. Rinse quinoa well and add to water. Return to boil, then reduce heat to low and cover. Allow to simmer, untouched, for 25 minutes, then check to see if water has been absorbed. If not, continue simmering until all water is absorbed, then uncover and allow to cool. (If you are in a hurry, you can turn the hot quinoa into a glass bowl at this point and place it in the fridge for about 30 minutes). In a nonstick frypan, heat oil and add garlic and lemon zest. Cook and stir for 2 minutes, then add lemon juice, balsamic vinegar, oil, mustard and stevia. Remove from heat. Add beets to cooled quinoa. Break walnuts into pieces and add to the bowl. Pour dressing (the liquid in the frypan) over and toss well until quinoa is tinted pink. Add cilantro and combine well. Season to taste with salt and pepper. This salad is even better the second day, after flavours meld. Makes 4 servings. * We did meet eventually, and he was just as sweet, sensitive and quirky as he appeared to be at the game. Oh, and about a month later, he asked me to go out with him, and then he became my very first boyfriend. See? Sometimes, the underdog does get a break. Love the intercollegiate football game story – you should seriously write a book, since all of your tales are so engaging and fun!! Congrats on the 200+ posts! And thank you for them too–I know it must be a lot of work, and it is appreciated. I remember making my mom a birthday dinner once in jr high or high school–she LOVES beets, so one of the things I was making her was a roasted beet salad. My hands/fingernails were stained pink for days!! I learned my lesson then…beets are good, but must be handled with care! Well, time DOES fly. Well done, you. And yep. It’s that third syllable of underdog that makes me feel, like you, an underdog. Can you believe I’ve never seen Rocky? Congrats on your 200th post! Where has the time gone, indeed… I just realized that tomorrow I’ll have been blogging for a year! Yikes, has it really been that long?! And congrats on your 200th blogpost, love reading your food stories. I admit that beets have never been a favorite of mine, but you always have a way of bringing out the higher qualities of “underdog” veggies. Great story. Beets are just too earthy for me too. But I enjoyed the college story! happy 200th, Ricki! time flies when you’re having fun and making beautiful food. great story, and congrats on your 200! keep ’em coming! great combination – v interesting to see how you adapt it to your diet – I love beetroot for its colour and it tastes wonderful roasted – I think it is really proving to be a bit of an ugly duckling that is turning out to be a swan! Oddly enough, I was just singing the praises of quinoa to my mom, after telling her about your tagine. Weird. We have a superfluous supply of beets in the garden, so we’ll have to give this recipe a go. I’m really excited about the Masters program. I’m working as a TA as well, so I’ll stay plenty busy, but I love how small and intimate the classes are (around 15 students per grad class). Everyone WANTS to be in class, and wants to share their opinion, and wants to learn – it’s an amazing environment! Wow! 200th post! You’re a blogger rock star! I agree with Céline, when you’re having fun and eating and making lovely food, well, you don’t see the time pass at all! Your post brought a huge smile to my face! I couldn’t agree more – underdogs of all sorts are what makes this world special and creative and interesting! I adore beets – and I already adore the guy at your freshman football game! 🙂 Such a beautiful story… and an absolutely gorgeous recipe too! Nice post! I love roasted beets. But sometimes if I’m not careful my hands and my kitchen end up covered in beet red for a week! Congrats, Ricki! Keep it up as I enjoy reading your blog! After having too many beets in high school (we had a little school garden, and the beet harvest was about 5x the amount expected) my enthusiasm for beets vanished. But it’s been years since, and maybe I should give this a shot. If anything, I’ll have dazzlingly red lips! Happy 200, Ricki! I’m almost to 100 on mine. Your salad looks fabulous & I’m in a walnut mood lately, so I love your walnut-appreciative posts! 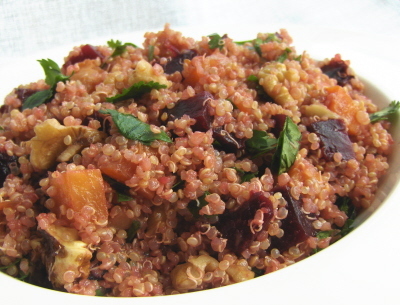 I adore beets and quinoa is one of my favorite grains. I’m loving this creation! I look forward to your next 200 posts! Nice salad. A great way to enjoy quinoa. Congrats on 200+ posts! Mmmm yum! I adore beets (but don’t eat them nearly enough, generally cause of the red dye factor). This recipe sounds drool worthy. I’ve starred it for slightly warmer weather (that is thankfully on it’s way). I always hated beets when I was a kid, even made mom keep them at the other end of the table 🙂 I tried them again this year and love them! This sounds right up my alley, probably with a little goat cheese!! Thank you so much! Glad you enjoy the stories. 🙂 Does a cookbook count?? I do the same thing every time I cook beets–always forget about the staining and go around with pink fingernail beds for days! We (under)dogs have to stick together! 😉 And Rocky (the first one, anyway) is worth seeing, especially if you’re in a sentimental, sappy kind of mood. Great for a cool winter’s day! Thanks so much for your comment,and for visiting! And I’m glad you enjoy the blog. It’s been a fun 200 posts, for sure! I thought of you when I posted this, as I remembered that beetroot was a favorite of yours! I hope it is “coming into its own” these days! Yes, it’s true–I sometimes wish I could just cook all day and do THAT as my “job”! As long as it’s still fun, I’ll still play in the kitchen! Thanks so much for your comment, and for visiting! Gladl you enjoyed the story. I’ve certainly had the same experience with red hands for days. . . the perils of beets! Sorry to hear about the overload! But it may be time to try again. . . let me know how you like it if you do try! Thanks so much, and congrats on your big milestone, too! Let me know how you like the salad if you do give it a try! Thanks so much, and for your comment! Glad you liked the look of the salad. Thanks so much! I feel the same way about beets (nowadays–didn’t always). But hate that red dye! Roasted beets are definitely the way to go! I have some leftover beets in the fridge that would be a perfect candidate for this recipe! HH is a lucky guy! This sounds mouth watering. 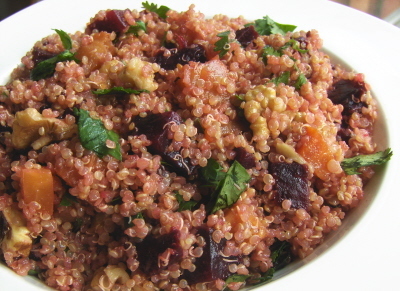 I like the idea of the nutrients of beets mixed with the protein packed quinoa. Can’t wait to try it. I made this last night and it turned out superb. Hi, I made this tonight, and DH has asked me to make sure I make it again. I love quinoa, and the whole salad came together beautifully, I used organic ground mustard instead of Dijon mustard, used apple cider vinegar instead of balsamic, honey instead of stevia, and parsley instead of the cilantro which I think tastes like bitter grass. Fantastic recipe, thanks. This is the second recipe of yours I have tried, and both have been wonderful. I am also buying your book next week. I might have to work through your blog and try many more recipes! What happened to the Dijon? Thanks for entering your recipe into TGIQ this week. It looks absolutely delicious!